Just a few days ago I commented that the sequel to "Twins" was the exact film we didn't realize how much we wanted until after the fact. Today, that feeling is taken one notch further. 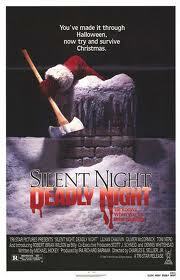 Variety is reporting that the original film featuring the serial killing Santa, "Silent Night, Deadly Night", is ready for its makeover. Anchor Bay has acquired the rights to the film, and will begin filming next month. Assuming all goes to plan in that department, the film, this time around simply titled "Silent Night", will be released to the children of the world this holiday season. Normally, you might not expect a project like this to garner so much attention, but with a cast that's headlined by Malcolm McDowell - let alone the cult following that the film has picked up over the years - this project will surely make some noise in the movie industry. The original version of this film was released back in 1984. The premise saw a family slaughtered on Christmas by a criminal dressed as Santa Claus. There was one survivor though, a young boy. Things seem fine for a while, but after years of repressing his memories of the massacre, he snaps one Christmas and goes on a murderous rampage dressed as the jolly man himself. While the film was, for lack of a better word, massacred by critics, the campy tone and exploitative nature fared well with the midnight crowds, and even led to the creation of four more sequels. (Note: I was going to attach Gene Siskel's review of the film in a link above, but it's just too good to take the chance of someone passing over it. Check it out below). That's just fantastic to me. I understand the sancity of the holidays and the tradition for the children, but lighten up. Anyone who gets this upset by ANY movie needs not to be reviewing them at all. I've always respected Siskel's contributions to the film critic community, but this is too much. A local police department’s search for the killer Santa Claus terrorizing a remote Midwestern town on Christmas Eve. McDowell will play Sheriff Cooper, a small-town hero ready for some big-time action. I think this film will be a lot of fun! If they keep with the same styles as the original film, I don't expect this to be anything less than entertaining. This is exactly the type of movie I'm trying to watch during the holidays. I really hope that it ends up getting a wide theater release. What do you guys think? Any interest in this reboot? This could benefit from a remake. I would definitely check this out during the holidays.